Add to any sensory room or space. 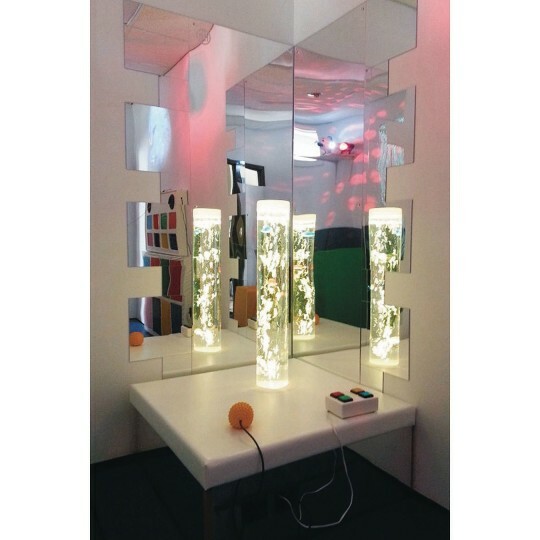 Corner bubble tube podium with acrylic mirror sides for added depth to any sensory room or space. Comfortable but durable foam and vinyl top with the tube hole set back to allow more room to get up close with the Bubble/Hurricane Tube. Top cushion color is white to allow flexibility in the room with projectors and to reflect the color of the Bubble or Hurricane Tube. Use with any of our Bubble Tubes or Hurricane Tubes (6” diameter). Corner installations only. Comes flat packed for easy assembly. Dimensions are 36”L x 36”W x 18”H. Recommend to stabilize your Bubble Tube with the Corner Bubble Tube Bracket 19778 (sold separately). Price is for podium only. Does not include bubble tube or wall mirrors.